Sometimes I let myself relax and go with the natural flow. Let the beauty of Mother Nature strike the core of my heart, give me inspiration, and tell me its stories. Art is a freedom from within. The thought of art is direct and not contrived. I cannot verbalize artistic thought; yet the image is high and clear. Oriental philosophy considers it as epiphanic insight. If we use a poetic rather than an analytical mind, we can appreciate the beauty of art to nourish the spirit. The amazing beauty of nature is beyond our imagination. 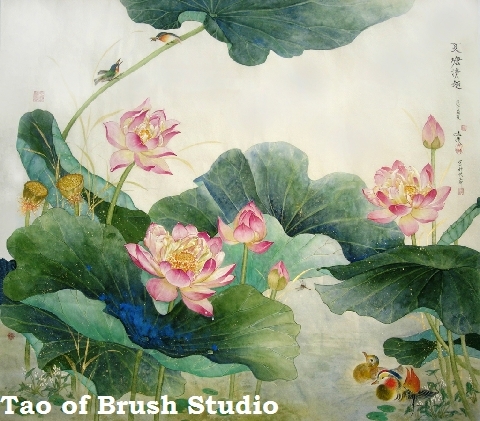 A pond of water lilies with soft petals, delicate veins, and curly leaves, waving in the breeze, how pure! How clean! Although her life is short, her beauty has not been lessened. If no one comes around to praise or admire her, she doesn’t mind. She continues to bloom and glow. In the fall, she withers, integrates with the mud, settles at the bottom of the pond, and nurtures a new life for the coming year. What message does her existence bring us? Once after a 3-day retreat, I went home to deal with the day-to-day issues again. I can’t help but feel burdened. How do we simplify ourselves? Autumn is a season of change. Recently on a trip through upstate New York, I had the opportunity to observe the changing season. I tried to find a new balance amid the busy activity of life. “One blot of light ink, a few drops of black spots will lead one into peace.” Less is beautiful; so is the faint. When you leave out the extraneous, only the essence remains. How does this apply to one’s life? The combination of concrete form and empty space are parts of the subtle Chinese aesthetics. 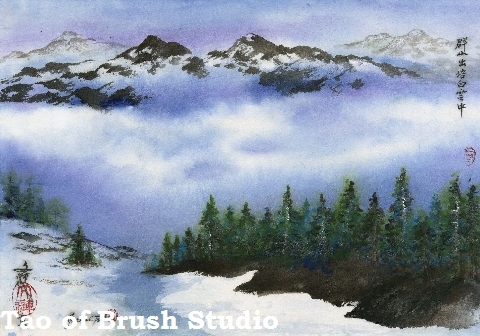 The misty cloud and the smoke all contribute to the overall atmosphere and depth. 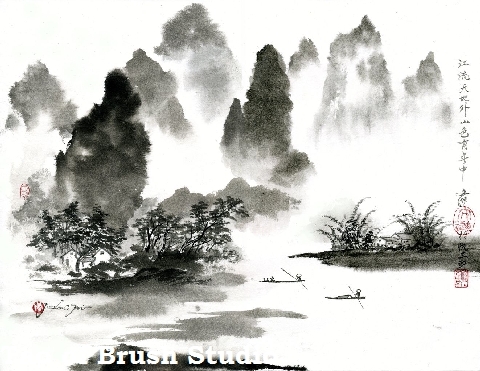 As Wang Wei(701-761) said in his poem “The grand river flows beyond heaven and earth, distant hills float and fade.” How can we limit nature into one frame? 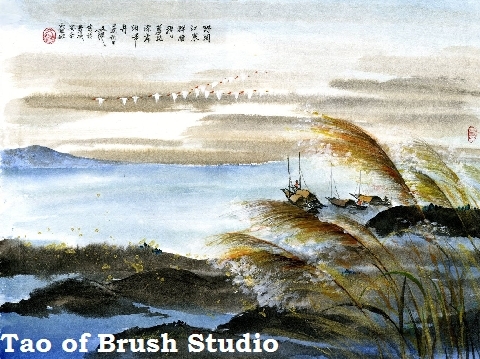 In Chinese painting, the open space also serves an important role. 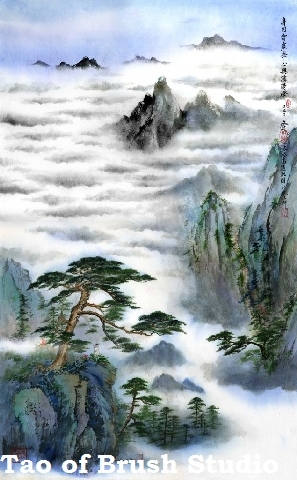 Often times the sky, clouds, fog, river, and waterfalls are represented by white space. This method gives the viewer the room for free association. Although not everything is visible in our lives, we all have a connection behind the scene. This sense of connection brings us deep contentment and trust. It serves us as the spring of life. Through the course of my readings, I read of the connection between heaven and earth, and of the past and future, all of which intertwine together as a whole. Likewise, the artist and viewer encounter each other and share a mutual appreciation through art. 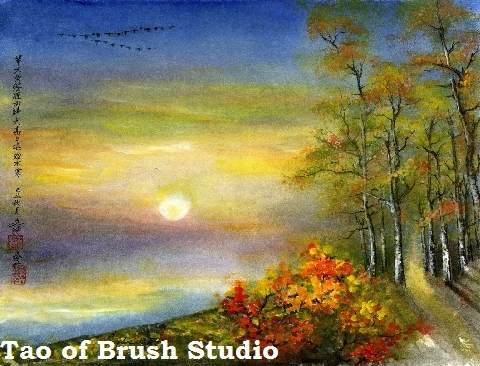 Painters use their heart as the brush and their feeling as the ink to create works with depth, vision and charm. My 95-year-old father passed away in January of this year (2009). Since his passing a great emptiness has remained in my life. Every time when I think of his kindness, wisdom, and great love, I am moved deeply with no words. Only painting helps me express my loss. 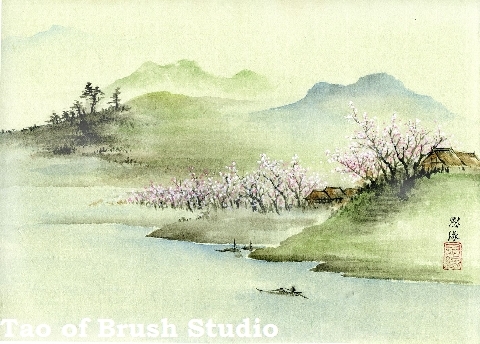 It is because of his encouragement that I began my journey in painting. When the night blooming cactus started to bloom again at home one night, the blossoms formed a contrast with my father’s poems. We do not live alone. We do not exist by chance. Whom we accompany with in a period of time in our life’s journey has its own “way of reason”. Love is forever, exceeding our time, beyond our understanding. Only one kind displays her true nature most. I see her baring her soul to the chilly moon and scattered stars. Just breathing her fragrant, unpolluted breathes in solitude. Don’t pity that her life is ephemeral. She knows someone appreciates her immaculate beauty. Her graceful entrance surprises the visitor. But she soon languishes away with only her fragrance left. For her pure heart, her deep love. One flower, one tree, is one Tai Chi (Universe). Observing from the outside, then one should receive inside. Reducing complexity and following simplicity, unattached to phenomenon, obeying natural laws, returning to the unedited truth, then even the rock can please its audience without speaking a single word. 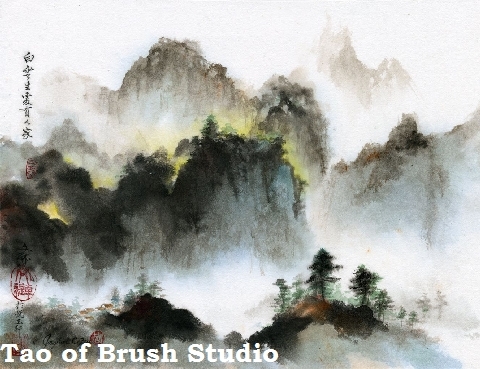 Yet here I am trying to capture the scene I saw when I visited Yellow Mountain in China years ago and present it as my gift to you. Returning boats are mooring near. 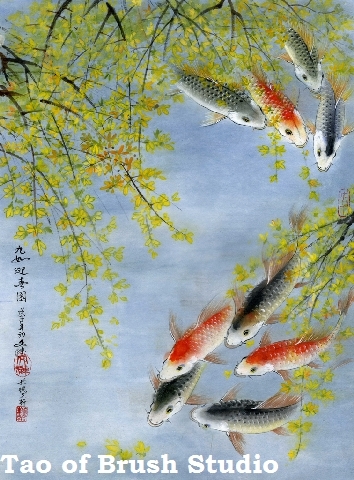 It is said: The secret of Tao lies in returning cycles. 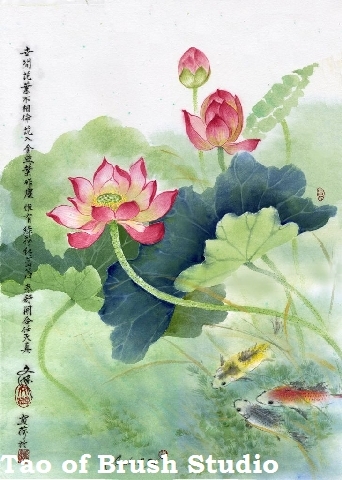 There are summer passions in the lotus pond. Flowers of the day accompany flowers of tomorrow and yesterday, wavering gently in the summer breeze and smiling to each other. A pair of mandarin ducks swims into the picture and a dragonfly catches her attention while our eyes follow their motion. The kingfishers under the green reaching leaf are willing to share their catch. Every captured moment is an adventure into possibilities. Have you heard their chatting? Can you smell the fragrance? What is it that we are not seeing? 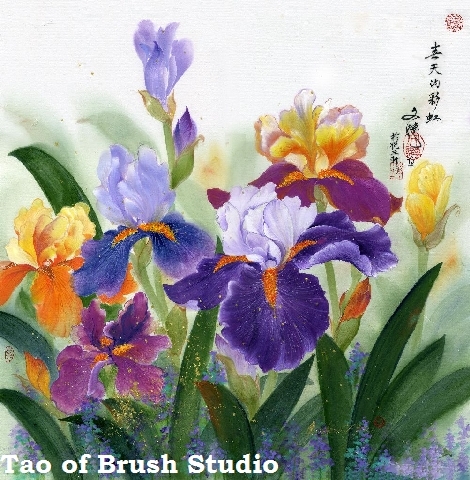 Chinese symbolic language and art forms are used to express good wish concepts. They originate from religion, myths and legends as well as from the phonetic sound of the prose. Nine generally refers to “a great many”. 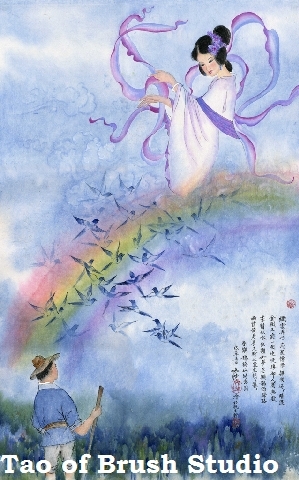 “9 wishes” was a prayer for Heaven’s protection which taken from the Tianbao Ode in the Xiaoya Section of the Book of Songs. 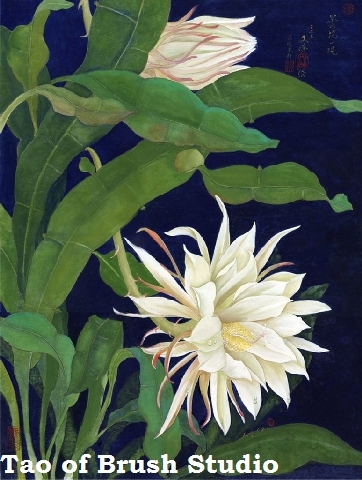 This is an auspicious painting especially for a prosperous New Year. The crane is a play on image for gathering and harmony (same phonetic sound “he” in Chinese). It is a symbol of immortality because its white feathers stand for old age, and the ancient Chinese believe that it could live for one thousand years or more. 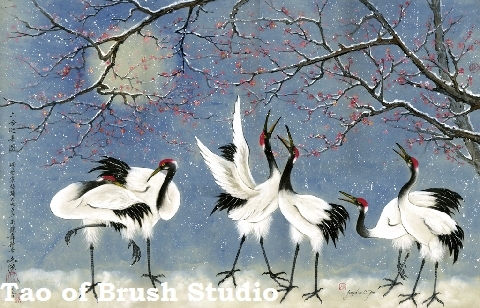 The six cranes symbolize for the 6 realms as well as harmonious gathering they are dancing under the plum blossom to welcome spring. Beautiful clouds made magic patterns. had ever shown their agony at their long separation. Such a meeting in the autumnal weather is far better than any other on earth. The tender feeling of a lover is as gentle as water. Their happy rendezvous seemed dreamy and fleeting. they came on the Bridge built by magpies? But an everlasting love would not care getting day and night. The seventh night of the seventh moon when the lengendary Cowherd and Girl Weaver meet each other for their once-a-year rendezvous over a bridge formed by sympathetic magpies over the Milky Way. The day is a festival for girls and yound lovers as Chinese Valentine's Day. This is a heavenly concept of prayer for the grace of love. The Book of Changes labels the peacock a cultured bird. 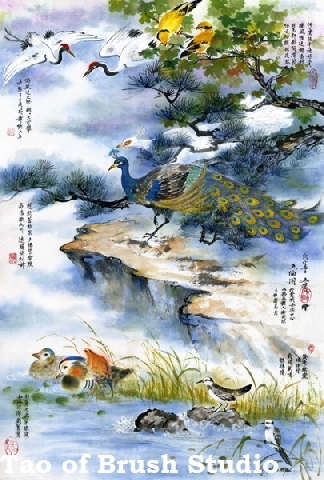 The peacock has nine virtues: proper appearance, clear voice, graceful walk, punctuality, restrained appetite, contentment, loyalty to its group, morality, and the ability to learn from its faults. The peacock feather, together with the coral hat knob, is part of the costume for a civil official of the first rank. They therefore represent the highest rank. In the painting the peacock surrounded by other creatures … his virtues make him a leader by which all might look to him for a path to enlightenment. 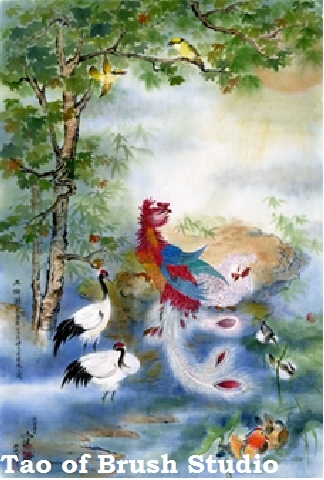 The painting shows the phoenix beneath a Chinese parasol tree twisting its head to look at the rising sun. He is accompanied by pairs of cranes, mandarin ducks, and other birds. The phoenix ranks first among birds, when it flies, the rest of the birds follow. Because the phoenix appears only during peaceful reigns, it is closely connected with the ruler. In the painting it stands for the relationship between a ruler and his officials. According to the Book of Changes when the father crane calls, his son harmonizes with his cries. Therefore cranes represent the relationship between father and son. Mandarin ducks mate for life; they symbolize the relationship between husband and wife. The Book of Odes compares wagtails to the relationship between brothers. The relationship between friends is represented by the orioles. When the oriole sings, it seeks the voices of its friends. It is the Divine Nature that weaves a bridge to travel to greater possibilities. To emerge from the creative mind a deeper richer connection to community of love. The color and space presents images to evoke humility to the Giver of the very world in which we imbibe. Blessed Be the Creator and all the Creatures within His care.